RANDOM: NAVRATHOS "Possessed From The Black Forest"
Two goats head on the logo, forest landscape as the cover, all in black and white; so what would you expect? Black Metal, precisely. Primitive black Metal, to be exact. 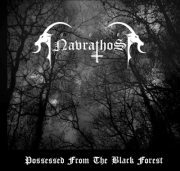 NAVRATHOS' "Possessed From The Black Forest" is another manifestation of crude and rude black Metal devoid of anything else. The sole special thank to Satan on the inlay thrusted their point even more. There's nothing else here than black Metal made unholy initiated by DARKTHRONE in their "Under A Funeral Moon" album, the said album fumes and looming large throughout this disc. But at least NAVRATHOS does it decent enough. There is no question this is black Metal in and out, rendered with the right purpose and appeal. I'm sure the lyrics are as straightforward as the titles too. "Pig Devotee" is definitely an interesting song-title (and a good mid-paced song). For intolerant black Metal fanatics only. These guys eat emocorefukks for breakfast.